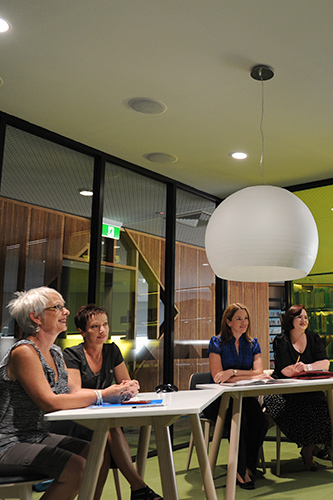 Bendigo Library offers the community a space to meet, learn, engage and create. The contemporary building features iconic architectural design incorporating all the elements of a traditional public library together with flexible and dynamic spaces. Features include multi-purpose activity spaces, state of the art meeting rooms and video conferencing facilities. Bendigo Library has three meeting rooms on the first floor. Each room has an LCD screen and data points for easy laptop and internet access. Rooms are suitable for meetings, small workshops and group training. The activity rooms are multi-purpose spaces located on the ground floor of the Bendigo Library. Bi-fold doors can be opened to create one large activity space or easily closed to create two rooms. The activity rooms are suitable for workshops, training, seminars, events and arts activities. To make an enquiry or to check room availability please email bendigoroomhire@ncgrl.vic.gov.au or phone 5449 2782. Activity Rooms 1 and 2 have access to self-catering facilities. Hirers must provide their own tea, coffee and milk. Crockery, glassware and cutlery is provided for use. Catering can be arranged via our preferred caterer Red Well Café located within the library. Please email info@simr.com.au or call 5443 5733 for further details. A discount of 25% for each session will apply for regular bookings (minimum 1 session per month over a 6 month period).